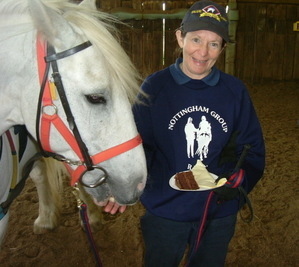 At Nottingham Group we have around 30 volunteers, both men and women, most of whom help on a weekly basis but some of whom help more with our fund raising and publicity activities. We have a number of qualified Group Instructors and one of these will teach the lesson. Although we run all day on a Thursday (Keyworth) , some people are only able to help for part of the day but that's no problem - every bit helps! No experience is needed as training is given. 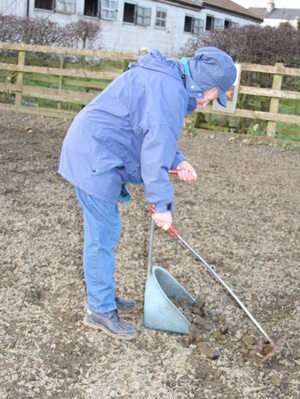 On a typical day, a volunteer might be involved in grooming and tacking the pony ready for the arrival of the children or they may be busy putting out equipment for use in the lesson, getting the children's hats ready or preparing paperwork. During the lesson they may lead a pony or help a child mount and then provide support as a sidewalker; as well as a leader there may be two sidewalkers for each child. Sometimes they may not be required to take part in the lesson but there is always something to do. Particularly important is being on call to repond to the shout of 'poo picker needed'! They may be wanted as extra support during a trotting activity, to fetch extra pieces of equipment, to manage the sound system ............in other words just about anything. If they were sidewalking then once the children have dismounted they will fill in paperwork to provide feedback about the child's progress and enjoyment of the lesson and any other useful comments about the child, pony or the lesson in general. 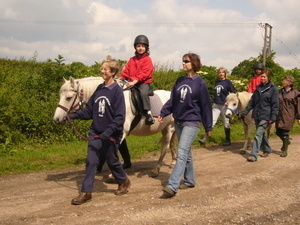 At the end of the riding session, a volunteer may untack the pony and return it to the field or help to put away any equipment and generally tidy up. We break for lunch and enjoy socialising and listening to notices and general information. Our group is gaining a reputation for always having a supply of cake to hand round - usually because it is someone's birthday but if not we can always find some other excuse! All volunteers are trained by a Group Instructor and also undergo a DBS check. We have regular training sessions in house involving both current and new volunteers. We also go to regional training days where posssible. If you would be interested in becoming a volunteer please contact us. We will then invite you to visit us to meet other volunteers and to see what we do.